As Novak Djokovic and Tomas Berdych battled it out in the final of the Monte-Carlo Masters. Things were also heating up in Barcelona as the final stage of qualifying for the ATP Open Banc Sabadell commenced with four seeded player’s booking their place in the main draw. Top seed James Ward produced a convincing match as he dropped only five games against Portugal’s Rui Machado. Going into the match the British number three had to overcome a tough three set match against wildcard entrant Eduard Guell Bartrina, a Spanish 16-year-old who is ranked 50th in the juniors. Fortunately for Ward he didn’t encounter such difficulty against Machado in the deciding round as he remained unbroken through the match to ease himself to a 6-2, 6-3, victory. Andrey Rublev’s progression from juniors into the pro circuit got yet another boost as he knocked out second seed Norbert Gombos 7-6(4), 6-3. The world junior number one produced his first ever main draw Masters win last month when he beat Pablo Casrreno Busta in three sets at the Miami Open. It wasn’t all plain sailing during the match, however, as Gombos opened a commanding lead in both sets (5-2 in the first and 3-1 in the second) before the current French Open boy’s champion battled his way back to take both sets. Rublev wasn’t the only junior to reach the main draw as Spain’s Jaume Munar produced a 6-2, 7-5, win against Argentina’s Pedro Cachin. Munar was the runner-up to Rublev in last year’s French Open Boy’s final. In the first round the 17-year-old was leading 6th seed Daniel Munoz de la Nava 6-3, 5-4, before he retired due to an apparent issue with his left knee. At 835th in the world, Munar will be the lowest ranked player in this year’s draw. Dutch third seed Thiemo De Bakker endured two close sets before edging his way past Germany’s Peter Torebko. After losing his first two service games of the match, Bakker started started to generate more consistency on court against Torebko to enable him to take the 7-5, 6-4, victory. Bakker has only played in the tournament once before which was in 2010. On that occasion he produced back to back top 20 wins over Juan Carlos Ferrero and Jo-Wilfried Tsonga to reach the semi-finals. During the only three setter match in the final round of qualifying, Marton Fucsovics spent over two hours on court to beat Kenny de Schepper. The Hungarian 7th seed came from a set down to win 4-6, 6-4, 7-6(2). He had two opportunities to take the final set 7-5 but failed to convert as Schepper forced things into a deciding tie-break. Unfortunately for Schepper in the final, he suffered three consecutive breaks of serve as Fucsovics surged to the win. The final qualifier into the Barcelona main draw is Yuichi Sugita. The Japanese world number 140 came into the qualifying draw with good form following his run to the final of the ATP St. Brieuc Challenger in France where he lost to Nicolas Mahut. St. Brieuc had been his first Challenger final since October last year. During his Barcelona qualifying campaign Sugita only dropped a total of five games (one against Juan Lizariturry in the first round and four to Oriol Roca Batalla in the final round). Posted in: ATP, Rogers Cup. Tagged: Alex Zverev, Andreas Seppi, atp, ATP 1000, ATP 250, ATP 500, ATP Masters, barcelona, bastad, bucharest, buenos aires, Carlos Berlocq, Clay, david goffin, Dominic Thiem, Dusan Lajovic, french open, Gilles Simon, gstaad, hamburg, Houston, Joao Sousa, Kei Nishikori, kitzbuhel, leonardo mayer, madrid, masters, mens, Munich, Nice, Nicolas Almagro, oeiras, Pablo Cuevas, rafael nadal, Rio, Roberto Bautista Agut, Roland Garros, rome, Santiago Giraldo, sao paulo, Stan Wawrinka, stuttgart, tennis, Tommy Robredo, Umag, vina del mar. After Kitzbuhel concluded last week, the clay court calendar portion of the 2014 ATP season came to an end. With that conclusion, we can now review which players performed the best, and which players underachieved on the dirt this season. Clay courts comprise a large portion of the ATP calendar so there is a much larger sample size to draw from compared to, say, the grass court season. 27 year old journeyman Argentine Leonardo Mayer has transformed himself into a top 30 player this season and his best results have come on clay. He posted 18 wins on the surface compared to just 10 losses this season at the ATP level and scored wins over household names David Ferrer, Philipp Kohlschreiber, Joao Sousa and Tommy Robredo on the surface; he also pushed top 6 player Tomas Berdych to three sets in Oeiras. He reached his first career final in Vina Del Mar, but fell short against Fabio Fognini there, and he finally got his maiden title in Hamburg over Ferrer in 3 sets. Winning that final set tiebreak ended a long journey to the top 30 for Leo and he remains an under recognized and underappreciated Argentine player. With Del Potro perpetually injured and Nalbandian now retired, Argentine will have to look to the likes of Mayer to carry Davis Cup and national hopes for a while. He reached the third round of the French Open and had quarterfinal appearances in both Oeiras and Nice to round out his best results on clay for 2014. Carlos Berlocq joins his countryman Mayer as a surprising player this season. He won an ATP title for the second year in a row, this time coming in Oeiras where he upset and outlasted Tomas Berdych. The loud and flamboyant dirtballer also posted quarterfinals in Nice and a semifinal in Bastad to compliment his win in Oeiras. This highlights an overall 16-9 record on clay at the ATP level for 2014. He tends to get overmatched in the masters level and grand slam events but against a 250 level field he often flourishes. Notable opponents he defeated this year on clay include Andreas Seppi, Milos Raonic, Ferrer and Lleyton Hewitt at the French, along with the aforementioned Berdych. Santiago Giraldo, a shotmaking Colombian with a huge forehand, has also had some of the best success of his career this season. He went 19-11 on clay and though he did not win a title, he reached the final in Barcelona, his second career final, along with semis in Houston and Vina Del Mar, and a pair of quarterfinals in Madrid and Stuttgart. Giraldo beat top players Tommy Robredo, Andy Murray, Nicolas Almagro, and Jo-Wilfried Tsonga this season. Giraldo joins Mayer as a first time top 30 player after success on clay. Kei Nishikori had an underappreciated clay court season this year, partially due to the fact that he had to battle injuries during that portion of the season, He played just three tournaments but posted a 10-2 record in them with a title in Barcelona and a final in Madrid, where he took a set off Nadal but had to retire during the third set of the match. He had top tier wins over Roberto Bautista Agut, Marin Cilic, Ferrer, Ernests Gulbis, and Raonic among his 10 overall and should he be able to stay healthy he has shown himself to be a threat on clay. Bautista Agut is the last player I’ll discuss. He went 12-5 on clay and won his first title on the surface in Stuttgart over Lukas Rosol. Success on clay has helped him reach the top 20 for the first time in his career and he beat Robredo, Fernando Verdasco, and Fognini this year on the surface. RBA doesn’t play prototypical Spanish tennis but he’s still a top performing Spaniard on red clay. The powerful Spaniard Almagro had been outclassed by his much more successful countryman Nadal eight previous times on clay. Finally, Nico was able to get a victory against perhaps the greatest clay courter of all time. The first set was a routine affair, but Almagro fought back hard and Rafa played poorly, resulting in Nadal’s first loss on clay after winning the first set in over six years. Nadal had his chances to close out the match in the second, and didn’t face break points himself, but he couldn’t convert and the tiebreak went against him, giving Almagro an opening he took advantage of by winning a decisive fifth and final break in the third set to seal the victory. Nadal struggled to win his service points, and at the time, many were deeply worried about how he was playing going into the French Open. The fact Rafa did win the French perhaps makes this victory by Almagro look even more improbable and top quality, given Rafa showed his career wasn’t in serious decline yet. A trio of young players found maiden ATP success on clay, while new Austrian number one Dominic Thiem was a mere 12-8 on clay at the ATP level. He went 4-0 in qualifying matches on the surface and won multiple main draw matches in Barcelona, Madrid and Hamburg. He finally reached his first career ATP final on home soil in Kitzbuhel and appears very close to his first career ATP title. Thiem had notable wins over Radek Stepanek and Stan Wawrinka this year on clay. Alex Zverev, a teenager, notably made the semifinals in Hamburg, a one off showing but clearly a sign of things to come for the young German. Zverev had wins over Mikhail Youzhny and Giraldo en route. I have a feeling Thiem vs. Zverev may develop into a clay court rivalry in the future. Both players have things to work on but we could have a Germany vs. Austria French Open final come 2018 or beyond. Dusan Lajovic established himself as a top 70 player with a strong clay court season. He also established himself as the Serbian number 2 behind Djokovic and should feature on their Davis Cup team for quite some time. He went 14-11 in both ATP main draw action and qualifying on clay this season and along with quarters in Hamburg and Bastad, he reached the round of 16 at the French Open, his best ever result in a major. He didn’t beat many top names this season but he still proved he can grind out matches to increase his ranking. The well-liked veteran Spaniard Robredo went just 15-12 this year on clay after going a tremendous 25-10 on the surface in 2013. His age may finally be catching up with him as he reached just one final, one semi and one quarterfinal this season along with posting seven early round exits. Once he finishes this season he will have a lot to think about going into to 2015. Wawrinka did not have a terrible clay court season, but he underachieved after high expectations were placed on him after winning his first grand slam in Australia at the start of the year. He won Monte Carlo, but that was the only highlight of his 6-3 clay court season. He had a trio of surprising early exits in Madrid, Rome and the French Open, and next season he will have much to gain during the clay court portion of the year. He posted a 43-17 record on clay over the previous two seasons before this one and has the ability to do much better than he did in 2014. After a breakthrough 2013, top Portugese player Joao Sousa was a disappointing 7-13 on clay in 2014, struggling against ATP level competition on the surface. He reached one quarterfinal and one final but suffered ten opening match exits and eleven early round exists overall with multiple losses to players ranked below him. Sousa will need to improve considerably and adjust his game if he hopes to be more successful on clay in the future. After struggling on clay in 2013, Italian veteran Andreas Seppi did so again in 2014. He is just 18-22 on the surface over the past two seasons and was 11-12 this season. He failed to reach a semifinal in any clay court tournament this year. 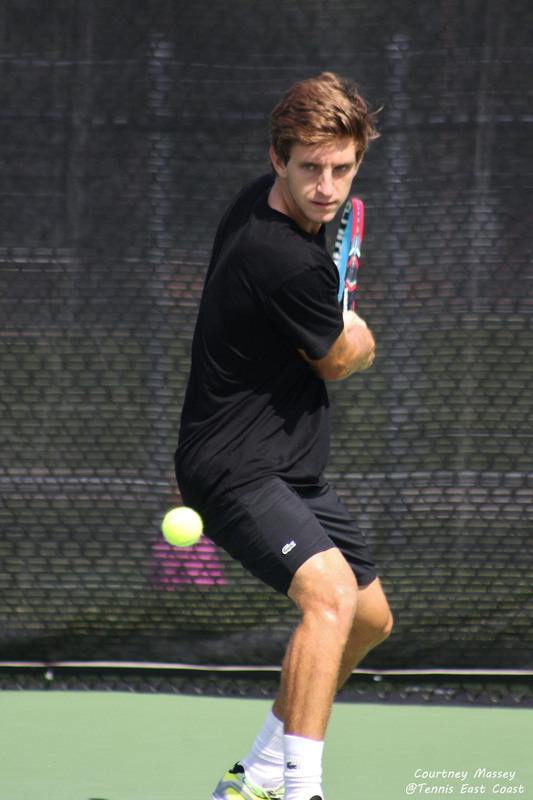 23 year old Argentine Federico Delbonis won his maiden title in Sao Paulo and has been successful on clay overall this season, posting an 18-13 ATP record. He later made a final in Nice, semifinals in Casablanca and a quarterfinal in Stuttgart to complement his Sao Paulo victory. Delbonis also showed his prowess on the red stuff last season when he reached the final in Hamburg and he should be a name to watch in many clay court tournaments to come. David Goffin snagged a maiden title in Kitzbuhel at the tail end of the clay court season after getting red hot on the ATP Challenger Tour prior. Goffin, who had that run to the fourth round as a qualifier at the 2012 French Open, and has seen his once promising career fade from the spotlight since then, returned to the challenger tour to find his game and hopefully he will be able to keep himself at the ATP level this time. Goffin is undersized and many players were able to hit him off the court at the top level but perhaps he has rediscovered a path to success for himself given the limitations of his physical stature. Lastly, Pablo Cuevas, who has overcome multiple knee and shoulder injuries and built his ranking back up to ATP status from the challenger tour, won his maiden title at 28 years old in Bastad, then followed it up with a title in Umag a couple of weeks later. Cuevas makes his living on clay and has been rapidly improving as of late. He pushed Fernando Verdasco to five sets at the French Open and has wins over Robredo, Fognini, Seppi, Sousa, and Verdasco this season. Cuevas’ rise is a testament to his tenacity and the work he has put into his game. Posted in: ATP, Barcelona, Bucharest. Tagged: 2014, atp, barcelona, bucharest, Grigor Dimitrov, Kei Nishikori, mens, recap, tennis. Kei Nishikori was the most dominant player all week long in Barcelona, as he raced to a 6-2, 6-2 victory over surprise finalist Santiago Giraldo. Giraldo falls to 0-2 in career ATP finals, and Nishikori has now claimed two titles this season. Nishikori dropped his only set this week against Roberto Bautista Agut in his first match, prevailing in 3 sets. Then he got on a roll and crushed Andrey Golubev, Marin Cilic and Ernests Gulbis to reach the final. Giraldo beat Igor Sijsling, got a retirement against Fabio Fognini, saved a multitude of match points against Dominic Thiem to prevail in 3 sets 7-5 in the third, and then got a retirement against Philipp Kohlschreiber and a straight set win over Nicolas Almagro. Almagro earned a huge confidence-boosting win against Rafael Nadal in the quarterfinals, as Rafa has now lost to Ferrer and Nico in consecutive weeks, players he has dominated against in the past and on clay. Gulbis earns semifinal points but didn’t face a seed en route. Grigor Dimitrov also claimed his second title of the season, as the top seed beat Jiri Vesely, Sergiy Stakhovsky and Gael Monfils without dropping a set, then beat Lukas Rosol in straight sets in the final 7-6, 6-1 as Rosol came up short in his effort to defend his Bucharest title. Rosol hung around for a set and kept it competitive, as Dimitrov was shaky at points, but he quickly unraveled in set 2 and Dimitrov put the match on cruise control. Rosol beat Filippo Volandri, Jarkko Nieminen, Gilles Simon and then Robin Haase in 3 sets to reach the final. Posted in: ATP, Barcelona, Bucharest. Tagged: 2014, atp, barcelona, bucharest, david ferrer, Grigor Dimitrov, Lukas Rosol, mens, picks, predictions, preview, rafael nadal, tennis. The clay season rolls on with a mid-level 500 series event in Barcelona and the 250 in Bucharest. The top 16 seeds get first round byes, and Barca has a crowded field of players looking to break into that top 10 level, while not being very top heavy. The in-form Arguello, who is nearly into the top 100 now, received a wild card here and will face off with the struggling Dodig. Ivan, who, after a strong 2013 campaign has been a very poor 5-9 overall this year with 2 straight losses coming into this one, including a straight set drubbing at the hands of Pablo Carreno Busta. Arguello is far and above a clay court specialist and he is 12-6 overall on the surface this year, mostly at the challenger level. He’s 0-3 career in ATP main draw matches and 0-1 this year as he lost in Buenos Aires R1, and this match is a good chance for him to win his first career ATP match. He won the Itajai challenger this year on clay. Dodig struggles on the surface, and I think Facu will grab an upset win. The up and down Radek Stepanek will get a tough test against the rising Thiem, who yet again qualified for an ATP tournament main draw, the sixth time in seven tries this year for the Austrian who will be in the top 80 soon. He brings a lot to the table and already has 5 ATP main draw wins this year. Steps could still pull through, but if he shows up struggling, Thiem should advance. I’m picking Thiem to do so. An interesting matchup. PCB is ranked much higher, but Kuznetsov has a 2-0 h2h edge with both matches coming on clay. They are both young, talented players, though PCB has been more consistent and improved. As a result, his ranking is higher. Kuznetsov has had an up and down season with his best results being a pair of ATP quarterfinal showings, the most recent being in Casablanca as a lucky loser. PCB has had an uptick in results in the past 2 weeks after a very rough early part of the season. He reached the third round in Monte Carlo as a lucky loser and quarters in Casablanca before that. Given current form, I’ll go with PCB but probably in 3 sets. 8 time Barcelona champ Rafael Nadal, who is an insane 40-1 in Barca, having won the last 3 titles here, opens with a struggling Nikolay Davydenko or Albert Ramos. He would then meet Arguello/Dodig or another Spaniard, Feliciano Lopez, in round 3. Nadal is 4-0 career on clay against Feli and should be able to make his way to the semis, avenging the bitter taste of his shock quarterfinal loss in Monte Carlo to David Ferrer. On an interesting trivia note, Davydenko is one of the very few players to have a positive H2H against Nadal as he leads the series 6-5 with their last meeting coming 2 years ago and his last win coming in 2011. Given Ramos is also in good form, I don’t think they will meet. I doubt Davy would really want to, as I’m sure it’d be nice for him to retire with that h2h lead record intact. Nicolas Almagro retired in the third round of Monte Carlo with a foot problem and opens with Martin Klizan or Somdev Devvarman. Assuming he’s healthy, he should advance to face former Barca champion Fernando Verdasco in a Houston final rematch from a couple of weeks ago. Verdasco won that match, and I think he would do so again as long as he can get past Kenny De Schepper/Marsel Ilhan first. Expect a Nadal vs. Verdasco quarter, in what is always a fun matchup. The inconsistent but always entertaining Fabio Fognini, who lost in the third round of Monte Carlo with a third set bagel, opens with Santiago Giraldo/Igor Sijsling. Giraldo could prove to be trouble as Fognini is 2-1 career against Santi on clay. The Colombian last made semis in Houston. Fognini/Giraldo should be the third round opponent for Marcel Granollers/Thiem/Stepanek, as Dominic Thiem could make a run, or Casablanca champ Granollers in this interesting hard-to-predict section. The seeds in the next section are struggling, as a way out of form Jerzy Janowicz has lost 6 straight matches, the latest indignity against pedestrian veteran Michael Llodra in Monte Carlo. Jerzy will face Mikhail Kukushkin/Jurgen Melzer in round 2. Melzer played his first match back from injury this season, losing to Julian Benneteau in 3 sets in Monte Carlo. Kukushkin has lost 6 straight matches and whoever makes the third round out of there will be a weak competitor. Philipp Kohlschreiber is just 1-4 in his last 5 matches and faces qualifier Andreas Beck or Edouard Roger-Vasselin in round 2. ERV is nothing special on clay, and Kohlschreiber is probably the quarterfinal fave regardless, but this is a super open section that depends on players in shaky form. Four time Barca finalist David Ferrer, who made the semis in Monte Carlo and upset Nadal en route, will face Michal Przysiezny or Teymuraz Gabashvili in round 2 and then Dmitry Tursunov/Inigo Cervantes/Aleksandr Nedovyesov in round 3. Ferrer should cruise to the quarterfinals, where he is most likely to face the 8 seed Alex Dolgopolov. Those two also play entertaining matches together. Dolgo faces Albert Montanes/Marc Lopez in round 2, then one of Ernests Gulbis/Dani Gimeno-Traver/Roberto Carballes Baena. Dolgo just drubbed Gulbis in Monte Carlo and Ernie is struggling having lost 2 straight, while Carballes Baena gets a wild card by virtue of his semifinal run in Casablanca as a qualifier. Kei Nishikori is playing for the first time on clay this season after going 8-4 on the surface last year. He’ll face Lukasz Kubot/Roberto Bautista Agut in round 2. RBA/Nishikori is a real toss up match and I tip towards RBA to get through. Awaiting in round 3 are one of Benoit Paire/Andrey Golubev/Matteo Viola, with Paire still not having found his game since returning to the tour. RBA/Nishikori seem like a lock for the quarters. Awaiting them will be most likely either former champion Tommy Robredo or Marin Cilic. Robredo has been sub-par at points this year but he did reach the third round in Monte Carlo, and I expect him to be tested by Joao Sousa in his opening match, assuming Sousa beats Marinko Matosevic. Sousa comes off a 3 set loss to Fabio Fognini in Monte Carlo and continues to impress. Cilic was totally destroyed by Stan Wawrinka in Monte Carlo, and will face PCB/Kuznetsov in round 2 hoping to recover. As both players are accomplished clay courters, Marin should also be tested but is likely to prevail and get Robredo in round 3. Robredo and Cilic have a tied 2-2 h2h but have never met on clay. I’ll lean towards Robredo making the quarters. Giraldo, Melzer, Bautista Agut and Carballes Baena are all unseeded players who could post good results, but I’m going with Thiem as my official DH designation this week. Stepanek and Granollers are both beatable veterans and this would place him in the third round against Fognini/Giraldo, who are also beatable on a bad day. Should he make that leap, Kohlschreiber/Janowicz/Melzer or whomever he might meet in the quarterfinals is absolutely beatable and he may even be a favorite against, meaning he could post is first career ATP semifinal this week as a qualifier. Even though Rafa has been off this season, given his record here and his potential opponents, I don’t see how he would lose before the final against someone like Fognini/Kohlschreiber/Thiem etc. Verdasco has challenged him before but not on a consistent basis, thus I can’t really predict him to lose before the semis either. Ferrer, given his solid form and good past results here, should also make his way to the final Dolgo isn’t going to challenge him much on clay. With Robredo/Cilic/Nishikori or someone else in the semis, Rafa should win. Ferrer outfoxed Nadal in a very low quality match in Monte Carlo, but Rafa still entirely dominates the h2h including clay and he will be hungry for revenge. Given all their prior Barca finals, and all of the Nadal victories, I simply can’t pick against Rafa here. Only 2 top 20 players in Bucharest and a bunch of out of form players makes this a wide open and lightweight event. Not that much worth taking a look at in Bucharest early, but Jiri Vesely will have a punchers chance against Chardy, who is an even 4-4 in his last 8 matches having reached the second round in his last 4 events, including in Monte Carlo. Vesely is at home on clay, having gone 30-7 on the surface last year at primarily the challenger level, but he’s just 7-7 this year overall and retired in the second round of Casablanca in his last match. Chardy will be a favorite, but an upset by the Czech wouldn’t surprise me. Grigor Dimitrov, who comes off a third round loss in Monte Carlo after 2 close victories, will face Vesely/Chardy in round 2 and could get upset early if he continues to struggle. The winner is likely to face Andreas Seppi in the quarters, as the Italian opens with Carlos Berlocq then Sergiy Stakhovsky/wild card Patrick Ciorcila. Berlocq beat Seppi in Davis Cup on clay this year, but he’s just 3-3 on the surface this year, while Seppi is also 3-3 and comes off a third round loss in Monte Carlo. Stakhovsky would have a chance at a dark horse run but he can’t be considered reliable on clay. A struggling Gael Monfils, who after an amazing start early in the year is just 2-5 in his last 7 matches including a loss to Carreno Busta in Monte Carlo, will seek to get some rhythm going against a qualifier in round 2, and then one of Nicolas Mahut/qualifier/Adrian Mannarino/Marius Copil in the quarters. None of those other Frenchman are intimidating right now and Copil is in poor form, thus even if Monfils is well below his peak level he still should be able to make the semis. Mikhail Youzhny, who is also struggling, coming off a round 1 loss to Seppi in Monte Carlo, faces Matt Ebden/Robin Haase in round 2. Haase is nominally accomplished on clay but is in dreadful form himself–just 1-6 in his last 7 matches with 4 straight losses and 5 straight losses on clay. With all that being said, expect Youzhny in the quarters against most likely Thomaz Bellucci, as Bellucci needs to beat Denis Istomin and then Vasek Pospisil or a qualifier. Pospisil is 0-5 since returning from a back injury. Istomin retired in his last match in Monte Carlo and Bellucci has lost 3 straight himself, but at least has a record of being good on clay working in his favor. The qualifier will have a great shot at the quarters in such an incredibly weak section, but otherwise Bellucci should be a favorite. Yet another seeded struggler, Gilles Simon is an abysmal 4-8 this year and has lost 4 straight ATP main draw matches. He faces Victor Hanescu or Dudi Sela first. Having last made quarters in Casablanca, I think Hanescu probably reaches the quarters out of those 3 options, given he’s playing at home In Romania. Simon is a 3 time former Bucharest champion, however, and would love to right the ship where he has had success before. Defending champion Lukas Rosol is a possible quarterfinal opponent. Rosol, who made the third round in Monte Carlo, needs to defeat Filippo Volandri and then Leo Mayer/Jarkko Nieminen. Nieminen has complained about being out of shape and has been in poor form recently while Mayer has lost 5 straight matches, all on clay. I could easily see a scenario where none, one or just two seeds make the semis as players like Bellucci, Hanescu and potentionally Stakhovsky/Berlocq/qualifier could all make noise.That being said, the unseeded defending champion Rosol has a chance to repeat his title given the weak field. After Volandri and Nieminen/Mayer, Hanescu/Simon are entirely beatable in the quarters and Rosol has a 2-0 career h2h against Hanescu, who I think makes it. After that, Bellucci/Youzhny most likely in the semis are beatable and same goes for Dimitrov/Seppi/Monfils in the final. I’ll go with the top seeds in the top half only because I can’t make a credible case for anyone else right now, unless Seppi beats Dimitrov. Monfils is 1-0 against Grisha but they met in 2011 and he’s struggling right now with his consistency. Bellucci is 2-0 including a win on clay last year against Rosol, but current form has me going with Rosol. They have never met before, and Dimitrov is clearly the “better” player, but I just have a hunch he won’t win this title and the honor will go to Rosol instead. As long as he can hammer out holds of serve, eventually Dimitrov will crack under pressure. Posted in: ATP, Canada, Tennis Canada. Tagged: 2013, atp, barcelona, challenger, charlottesville, Filip Peliwo, Galo Blanco, milos raonic, Tennis Canada. Toronto, October 24, 2013 – Tennis Canada confirmed Thursday that former junior world No. 1 Filip Peliwo (Vancouver) will be teaming up with Spanish coach Galo Blanco, who will begin coaching 19-year-old Peliwo on a full-time basis on November 15 in Barcelona. Peliwo, who captured the Junior Wimbledon and Junior US Open titles last year, is one of Canada’s top up-and-coming talents. In his first season as a professional, he has climbed from outside the Top 500 to a high of No. 251. A member of Tennis Canada’s National Training Centre (NTC) in Montreal for the past four years, Peliwo will now join Blanco at his home base and academy 4SlamTennis in Barcelona. Blanco will travel with Peliwo on a full-time basis and will work as a team with Louis Borfiga and Tennis Canada national coaches. The Montreal NTC will also offer Peliwo supplemental training as needed. Blanco also coached top-ranked Canadian Milos Raonic (Thornhill, Ont.) for two-and-half years from late 2010 to May 2013, helping him rise from outside the Top 200 to a high of world No. 13. After concluding their off-season training in December, Peliwo and Blanco will begin the 2014 season in Australia. Lukas Rosol of the Czech Republic is one of the great stories on the ATP tour of the past year and he added a highlight to his year with his first ATP title in Bucharest, winning 6-3 6-2 over Guillermo Garcia-Lopez. With the title, Rosol makes the ATP top 40 for the first time. Rosol was by far the best performing player in Bucharest this week, winning matches over Gilles Muller, Andreas Seppi in 3, Viktor Troicki and defending champ Gilles Simon to make the final, dominating with both his serve and ball striking. He is normally known for his improved play on faster surfaces, but clay is still his calling card and it is fitting that he won his first title on the surface. Garcia-Lopez awoke from a slump to beat Horacio Zeballos in 3 sets, Sergiy Stakhovsky, Janko Tipsarevic in 3 sets and Florian Mayer in 3 sets. Max Mirnyi and Romanian Horia Tecau combined to win the doubles title over Lukas Dlouhy and Oliver Marach. Rafael Nadal improved to his 4th title in 6 events (making the final in all 6) and won his 8th overall title in Barca 6-4, 6-3 over countryman Nicolas Almagro. This was already Rafa’s 2nd victory on clay against Almagro this year. Nadal has still not been at his totally dominant 5th gear level this year, mainly being more cautious with his movement. But because he is simply so talented on clay, he was able to coast by most of his opponents this week, beating Carlos Berlocq, Benoit Paire, Albert Ramos and surprise semifinalist Milos Raonic. Because of rain, Nadal beat Paire and Ramos in the same day. Almagro beat Ivan Dodig, Marcel Granollers, Juan Monaco and Philipp Kohlschreiber to make the final. Alexander Peya and Bruno Soares won the doubles title over Robert Lindstedt and Daniel Nestor. Lance Luciani is the President of Baseline Tennis and his most-promising prodigy is 11-year-old Adam Neff, who just won the Boys’ 12s National title. Neff will represent the United States when he competes against finalists from 15 countries around the world at the Longines Future Tennis Aces in Paris, France during the first week of the 2013 French Open. The USTA Boys’ & Girls’ 12s National Spring Championships presented by Longines and hosted by the City of Delray Beach served as the U.S. qualifier for Longines Future Tennis Aces with the winner of the Boys 12s singles division earning a once-in-a-lifetime trip to Paris to play against qualifiers from 15 other nations. 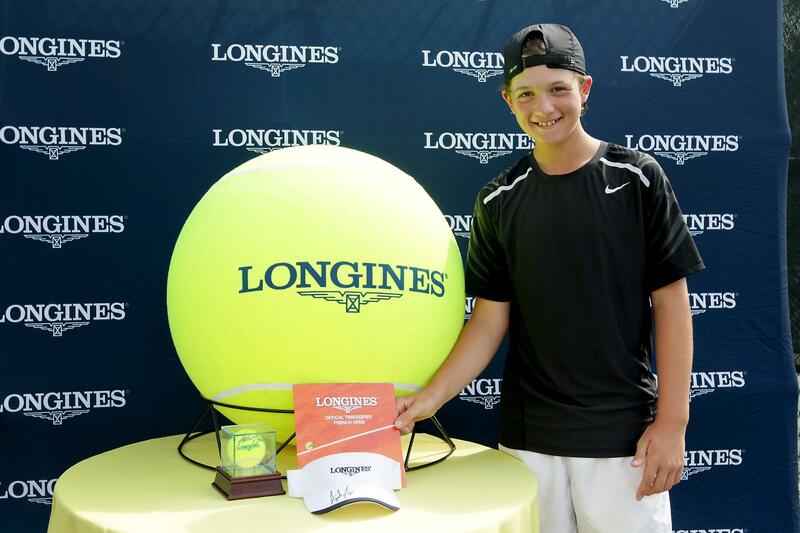 In addition to winning an all-expense-paid trip and the opportunity to play tennis in the center of Paris, Adam will compete to receive financing for his tennis equipment until his 16th birthday, courtesy of Longines. Neff, who will turn 12 on May 30, competed against 128 other top-ranked U.S. players in the week-long USTA-sanctioned event. En route to the title, Neff was nearly flawless and never dropped a set to any of his competitors. Last Sunday, I had a chance to ask Coach Luciani about Adam’s physical development, how he got here and where he’s headed. He’s physically maturing now. He’s almost 5’8”, and it’s turning in to a lot of muscle now. Before he was shorter and he was a little bit larger kid but now he’s slimmed down. He’s trying to get a six-pack. He’s getting stronger every month. Adam’s physical trainer (Doru Murariu) is doing a really good job. Adam battled a setback in France last month, and that may have poised him to make the run through Delray Beach for a return trip to France. Did Coach Luciani actually expect him to win it all at Boys Nationals? I kind of thought that Adam was going to be peaking about that time, because he was really mad that we went all the way to France for a tournament (Auray) about 6 weeks ago. It was really cold and it was indoor tennis. They don’t heat their indoor facilities, so you’re blowing smoke indoors. We went in there about 5 days earlier, and the day of the 1st round match he got sick with the Norwalk virus. He just couldn’t move. He said ‘I came all this way and I can’t even move’. He lost in 3 sets to someone he shouldn’t have lost to. He lost 13 pounds after that. It really made him determined over the month in between that tournament and Delray that he was going to put on a good show. He said, “I’m going to try to go back to France again. I’m going to do this.” And he didn’t lose a set. When we found out the prize at Nationals was a Longines trip to France, he was happy his dad wouldn’t have to pay for the trip back. He said, “now I’m going to go over there again and show them what I can do”. What can Adam expect from the Longines support? They’re going to pick up all the flights and hotels and all the food, and it looks to me like they put on one heck of a show. They treat the kids first-rate. To be playing at Roland Garros during the French Open! What’s a better experience than that? How do you like Adam’s chances at the Longines Future Tennis Aces at Roland Garros? With the 12s, Adam definitely has a chance to beat just about any 12-year-old. He’s getting stronger and bigger. I’ll just try to get him ready correctly and see how it goes. When did you become involved with Adam and tell us the history of the training facility you’ve built at his home. I thought about it for a while and told him ‘the first thing you’ll need is a facility with European red clay. It can’t be Har-Tru. You can save a lot of money putting that in, but he’s got to grow up on the red. So the first court we put in, we imported Italian red clay. We have one of the only real European red clay courts in the country. Second court we put in is similar to the Sony Open court. It’s a little bit of a slower court. It has seven layers on it. It’s still good on his ankles and joints. It’s a slower court so that when Adam was working on form, he didn’t have to change his form because the ball was already past him. Right now, we’re constructing a faster US Open court. It’s got 11 layers of cushions and it’s still good on their joints. They also have a full indoor gym and a CVAC Recovery Pod, just like Novak Djokovic. Since Adam’s dad is a doctor, he researched the product first. Then Luciani flew to California to the manufacturer for a week to investigate the pod. Adam’s ranking was #282 nationwide and #38 in Florida when he began using the pod last July. Today, he’s ranked #4 nationwide and #1 in Florida. Luciani calls it “a bit of an improvement”. The pod gives him ‘even more of an ability to come back daily’, according to Luciani. What is Adam’s typical tennis routine? Four hours per day during the week, a half-day Saturday or a tournament on the weekend, a daily hour of private fitness and a 90 minute recovery regimen, including CVAC pod time. What style of coaching do you employ on Adam? When you train someone like Adam, you can’t really work them 110% intensity morning and afternoon all the time, because they’d die a violent death! You’re always gauging every day how much they handle. Now that he’s winning tournaments, I’ve got to count matches like baseball managers count pitches. Whose game does Adam’s resemble the most? His game is based on Agassi. That’s my method. Control, hurt, finish. That’s how big points are built. Control your opponent, knock them off the court, make them run, and if they give you a chance, then you finish them. It’s a very aggressive system, but in my opinion, it’s what America is waiting for again. Someone who can entertain them. We’re missing that right now. Serena and Venus have entertained us, but their careers are coming to a close. Who’s next? Who’s going to make the other guy run? Though Neff’s style is reminiscent of Agassi, Adam’s personal favorite is Rafael Nadal. “That’s who he looks up to” said Luciani. When not playing tennis, being home-schooled or spending time with his family, Adam enjoys his dogs Rafa & Coco, watching ESPN, and texting friends. He’s just a good kid. For me to be with someone for four years, that says something because I usually lose patience with them and if they don’t listen, I’ll get rid of them. There’s definitely no reason to get mad at him. Barcelona and Paris are next before Adam moves into 14s. Coach Luciani and Adam are hoping for a high seed in the Orange Bowl or Eddie Herr at the end of the year. Now you know: Adam Neff is one to watch. America needs more kids like Adam and we’re hoping to see him on a US Open-style court at the US Open in the years ahead. Longines is the proud Official Partner and Timekeeper of the French Open at Roland Garros since 2007. Longines Future Tennis Aces – On the Road to the French Open is part of Longines’ global commitment to support and develop tennis’ superstars of tomorrow. All the players who qualify for the tournament will have the opportunity to visit the red-clay courts of Roland Garros and attend a French Open match. Countries participating in Future Tennis Aces program include Australia, China, France, Germany, Hong Kong, Italia, Japan, Mexico, Poland, Russia, Singapore, Spain, Switzerland, Taiwan, United Kingdom and the U.S.
Longines has been based at Saint-Imier, Switzerland, since 1832. Its watchmaking expertise reflects a strong devotion to tradition, elegance and performance. It has generations of experience as the official timekeeper at world championships and as a partner of international sports federations. Over the years, the brand has built strong and long-lasting links with the equestrian sports.